Hand Forged or Ground from Flat Stock? Which is a better knife? The following article about carving knives is from the pages of www.deepwoodventrues.com, where you can find more interesting information regarding carving knifes and carving in general. Woodcarvers are on a constant search for the perfect carving knife. In that search, they sometimes ask me which is better, a forged knife or a ground stock removal knife? Are you intrested in Chip Carving? Chip carving is a simple process but gives a complex yet elegant look to your project. I have always been intrigued how chip carvers maintain that constant uniformity in their designs. In searching the internet I ran across the website my chip carving where I discovered a down to earth teaching video on how to hold the chip carving knifes and more. This bear was one of the first club projects that we tackled. It was great fun discussing this project in our group. 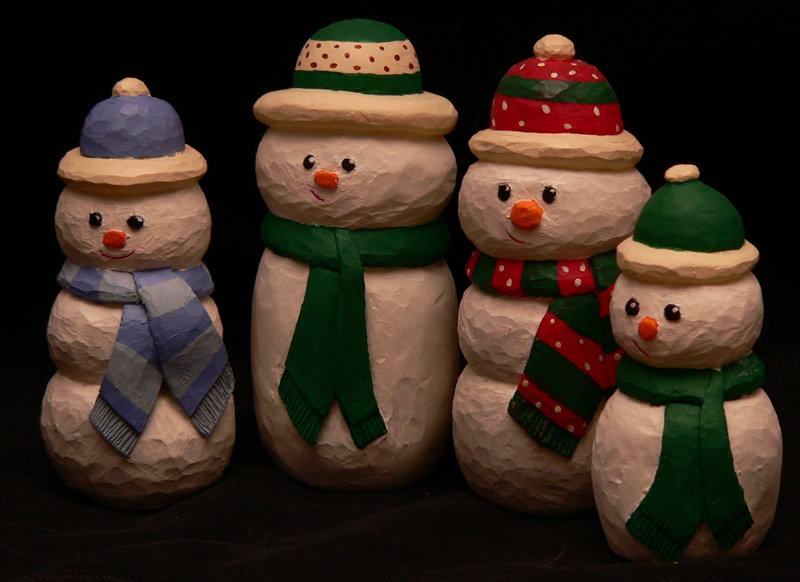 The Jayland carving club meets every Wednesday night at 6PM at the jay County Community Center. 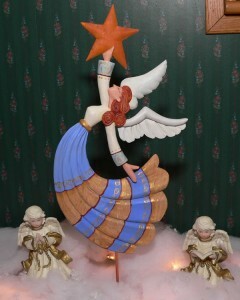 Carved for Indiana grown basswood, this tree topper took two weeks to carve and two days to paint. This project was carved from 2″ stock and measures 12″ in height. The stand is fashioned from #10 copper ground wire. This project came from WoodCarving Illustrated. When woodcarving keeping your tools sharp will produce clean cuts and makes the carving experience more enjoyable. The key in keeping your tools polished and razor sharp is the strop. A “Strop” is a piece of leather that is glued to a flat board. Polishing compound is often applied to the leather, this action is referred as “Loading” the strop. The Jayland carving club meets every Wednesday eventing at the Jay Community Center in Portland Indiana. Sometimes in our club meetings we working on a common project, and I have the opportunity to instruct the club on carving these snowmen that are pictured. This project will start mid November of 2009 if you are interested. I recently attended a session of the Jayland Carving Club in Portland Indiana. I had a great time and the two hours flew by, as our instructor Kevin walked us through carving a caricature carving of a bear. I have many folks as where do I come up with my carving wood supply. I look for trees that need to be trimmed in my neighborhood. I have located three Butternut trees that I keep a very close eye on. If I hear a chainsaw running you bet I’ll be the good neighbor and offered my assistance to carry away those heavy logs. Since I live in Indiana, Basswood trees grow everywhere. If you have a nature trail in your area take a walk, often you can find fallen limbs that can be saved from rotting away. Yes, I know that the basswood that grows in Indiana is just not the same quality that grows in Minnesota or Wisconsin, but free is free. When I want a really nice piece of straight grained basswood, I turn to a supplier from one of those states. I recommend Heinecke Wood Products because they offer a quality products and an inexpensive price. Don’t just take my word for it, check out their website at http://www.heineckewood.com. Take a walk and check out the trees around you. You may just find enough carving wood to keep you very busy.